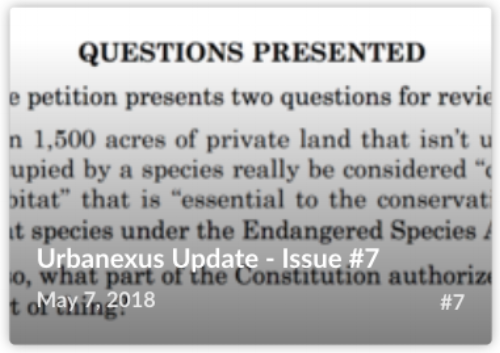 Urbanexus Update #7 is the seventh weekly update containing links to selected articles, images, tweets and videos about evolving physical, social and economic conditions within and around metropolitan regions that shape opportunities–and create challenges–for equitable and sustainable real estate investment and development. 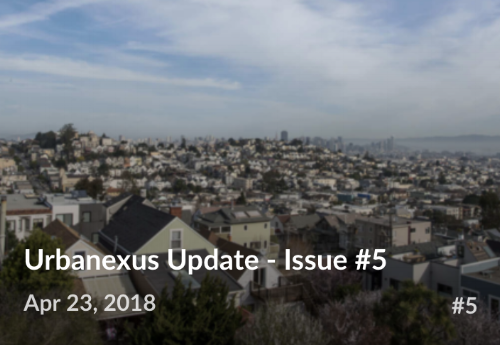 Urbanexus Update #6 is the sixth weekly update containing links to selected articles, images, tweets and videos about evolving physical, social and economic conditions within and around metropolitan regions that shape opportunities–and create challenges–for equitable and sustainable real estate investment and development. Filmmaker David Byars has produced a documentary about the armed occupation of the Malheur National Wildlife Refuge in southeastern Oregon during January and February 2016. "No Man's Land" is the title of the film that is scheduled to air on PBS's "Independent Lens" series on May 7, 2018. The film will begin streaming online on Tuesday, May 8, 2018. The trailer for the film is available here. Urbanexus Update #5 the fifth weekly update containing links to selected articles, images, tweets and videos about evolving physical, social and economic conditions within and around metropolitan regions that shape opportunities–and create challenges–for equitable and sustainable real estate investment and development. Ammon Bundy, Ryan Bundy, Shawna Cox, David Fry, Jeff Banta, Neil Wampler and Kenneth Medenbach. Jason Patrick: Convicted of conspiracy to impede, trespass, tampering with vehicles and equipment, and destruction and removal of property. Sentenced to 21 months in prison, three years supervision, and $10,000 in restitution to Friends of the Malheur Refuge. Duane Ehmer: Convicted of depredation of government property, trespass and tampering with vehicles and equipment. Sentenced to a year in prison, three years supervision, and $10,000 in restitution to the Burns Paiute Tribe. Jake Ryan: Convicted of depredation of government property, trespass and tampering with vehicles and equipment. Sentenced to one year in prison, three years supervision, and $10,000 in restitution to the Burns Paiute Tribe. Darryl Thorn: Convicted of conspiracy to impede, possession of firearms in a federal facility, trespass and tampering with vehicles and equipment. Sentenced to 18 months imprisonment, three years of supervision, and $5,000 in restitution to Friends of the Malheur Wildlife Refuge. Ryan Payne: Pleaded guilty to conspiracy. Sentenced to 37 months in prison, three years supervision, and $10,000 in restitution to Friends of Malheur National Refuge. Jon Ritzheimer: Pleaded guilty to conspiracy. Sentenced to a year in prison, three years of supervision, and $10,000 in restitution to Friends of the Malheur National Wildlife Refuge. Joe O’Shaughnessy: Pleaded guilty to conspiracy. Sentenced to time served, two years of supervision, and $7,000 in restitution to Friends of Malheur National Wildlife Refuge. Brian Cavalier: Pleaded guilty to conspiracy to impede and possession of firearms in a federal facility. Sentenced to time served, three years of supervision and $7,000 in restitution to the Friends of Malheur National Wildlife Refuge. Dylan Anderson: Pleaded guilty to trespass. Sentenced to a year of probation and $1,000 in restitution to the U.S. Fish and Wildlife Service. Sean Anderson: Pleaded guilty to trespass. Sentenced to a year of probation and $1,000 in restitution to the U.S. Fish and Wildlife Service. Sandra Anderson: Pleaded guilty to trespass. Sentenced to a year of probation and $1,000 in restitution to the U.S. Fish and Wildlife Service. Wesley Kjar: Pleaded guilty to conspiracy. Sentenced to two years probation and $3,000 in restitution to Friends of the Malheur National Wildlife Refuge. Jason Blomgren: Pleaded guilty to conspiracy. Sentenced to two years probation and $3,000 in restitution to Friends of Malheur National Wildlife Refuge. Travis Cox: Pleaded guilty to conspiracy. Sentenced to two years probation and $3,000 to the Friends of Malheur National Wildlife Refuge. Eric Lee Flores: Pleaded guilty to conspiracy. Sentenced to two years probation and $3,000 to the Friends of Malheur National Wildlife Refuge. Geoffrey Stanek: Pleaded guilty to conspiracy. Sentenced to two years probation and $3,000 to the Friends of Malheur National Wildlife Refuge. Blaine Cooper: Pleaded guilty to conspiracy. Scheduled for sentencing in June 2018, and already ordered to pay $7,000 to the Friends of Malheur National Wildlife Refuge. Urbanexus Update #3 is the third weekly update containing links to selected articles, images, tweets and videos about evolving physical, social and economic conditions within and around metropolitan regions that shape opportunities–and create challenges–for equitable and sustainable real estate investment and development. 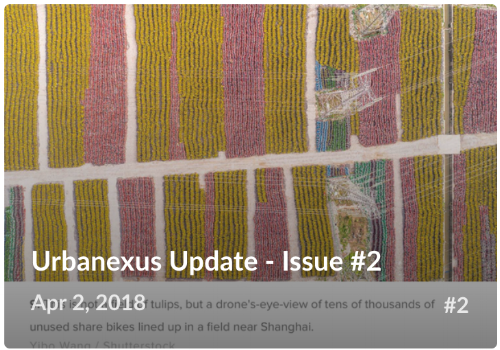 Urbanexus Update #2 is the second weekly update containing selected articles, images, tweets and videos about evolving physical, social and economic conditions within and around metropolitan regions that shape opportunities–and create challenges–for equitable and sustainable real estate investment and development. Urbanexus Update #1 is the first of weekly updates that present selected articles, tweets, and images about evolving physical, social and economic conditions within and around metropolitan regions that shape opportunities–and create challenges–for equitable and sustainable real estate investment and development. This is the best NPR Planet Money Podcast that I have yet to hear. You may listen to it by going here. Learn about the "captured economy." And remember, . . . " Wherever you say a power imbalance in society, you gotta ask yourself, who are the dentists and the tooth whiteners?" Also, after listening to his, I now realize that I am a " liberaltarian." You have to listen to the podcast to figure out what that is. And if you just want to read the book, you can do that. It is The Captured Economy: How the Powerful Enrich Themselves, Slow Down Growth, and Increase Inequality. The authors are self-described "liberaltarians", Brink Lindsey and Steve Teles. Since the 1970s, billions of dollars have been invested in carpool lanes in U.S. metropolitan areas. Despite the availability of these facilities, carpooling has steadily declined from about 20% of commute trips in the 1970s to less than 10% now (see figure). There is a good chance that some of the decline in carpooling is attributable to lower fuel costs. The average cost per gallon of gasoline in the USA was $1.22 in 1980 and in January 2018, it was $2.50. This seems like a significant increase. But when you adjust for inflation, the $1980 cost of $1.22 per gallon is equivalent to $3.92 in 2018. So, the real cost of gasoline in January 2018, was 36.5% less than in 1980. An article published on August 31, 2017, at the High Country News website highlights the limits of trial by jury. The title of the article by Tay Wiles is "Why the Bundy crew keeps sinning in court". It reports on how a Las Vegas jury acquitted two men for their role in the 2014 armed confrontation between the federal government and supporters of rancher Cliven Bundy. The article points out that when trying the Bundys and their supporters federal prosecutors have only one two convictions after two trials of six defendants in Nevada in 2017. And in 2016, Bundy's sons Ryan and Ammon and five others were acquitted of leading the armed occupation of the Malheur National Wildlife Refuge during January and February 2016. Mr. Wiles points out that the convictions probably reflect growing skepticism about government authority in the Mountain West of the USA. He writes that " . . . Juries have long been influenced by cultural norms outside the courtroom." He quotes Rory Little, a University of California Hastings College of Law professor who said, "In the 1950s, people were tried and criminally convicted for simply believing that communism is a good idea. . . . In the 1960s there were civil rights cases where certain juries in certain states just wouldn't convict a white person for interfering (with the lives of African Americans) . . ."
The problem is that jurors are instructed to use common sense and lived experience when evaluating evidence. 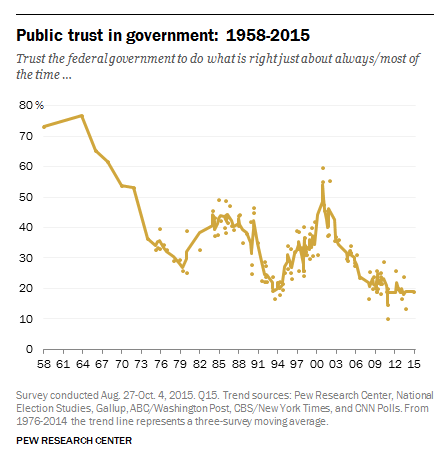 Mr. Wiles cites a Pew Research Report released in late 2015 that revealed that 80 percent of Americans did not trust the federal government to do what is right just about always or most of the time. That percentage was up from 66 percent in 2000 and 27 percent in 1958. On January 29, 2018, Todd Litman posted at the Planetizen blog a review of the perverse effects of municipal parking requirements. The article is entitled, "Fun Parking Facts." Mr. Litman also presents some shocking statistics on the amount of land consumed by parking in the USA as well as the extent to which municipally mandated parking is often under utilized. The conclusion is that we need more efficient parking management--now! Bryan Barnett-Woods, a transportation planner with the Maryland-National Capital Park and Planning Commission, has posted a great short article on the limits of zoning. 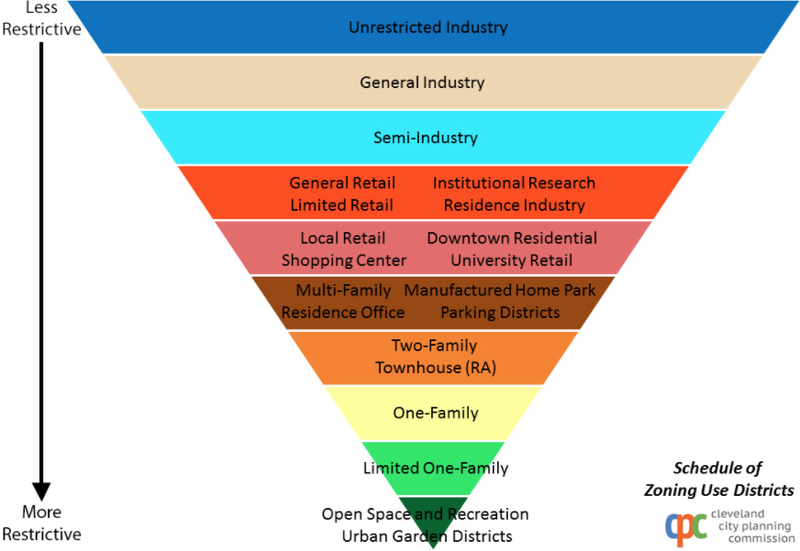 His main point is that while zoning can set limits, it cannot mobilize the demographic and economic factors that are critical to urban vitality. See Mr. Barnett-Woods' article here at the Greater Greater Washington website. On February 1, 2018, Mission Local (a neighborhood news service for the Mission District in San Francisco) posted an interesting article by Julian Mark about a police captain in San Francisco's Mission District who is trying to deal with homeless people in who refuse services. Shy, who lives in a homeless encampment on Alameda Street at San Bruno Avenue in San Francisco, sits on the curb while a Public Works cleaning crews sorts through her belongings. Photo by Laura Waxmann. As reported by the Eye on Housing blog of the National Association of Homebuilders, spending on private residential construction in the USA increased in the last months of 2017, following a slight dip earlier in the year. Expenditures on residential construction have increased dramatically in recent years following the dramatic declines that began in 2006 for single-family housing and 2008 for multifamily housing. The drop in single-family housing expenditures from the peak in 2006 to the valley in 2009 was about 75%. The magnitude of the multi-family expenditure decline from 2008 to 2011, was similar. Multi-family expenditures now exceed the levels achieved in the run-up to the Great Recession. Single-family expenditures still lag behind the peak level of 2006. A posting at the website of Local Authority Building Control in the United Kingdom (UK) summarizes what has been learned about land use in that country via analysis of high definition satellite images. Based on these digital images, maps were created consistent with CORINE (coordination of information on the environment) Land Cover protocol of the European Environment Agency. Interestingly, continuous urban fabric (CUF) only accounts for 0.1% of UK land and discontiguous urban fabric accounts for 5.6% of the land area. 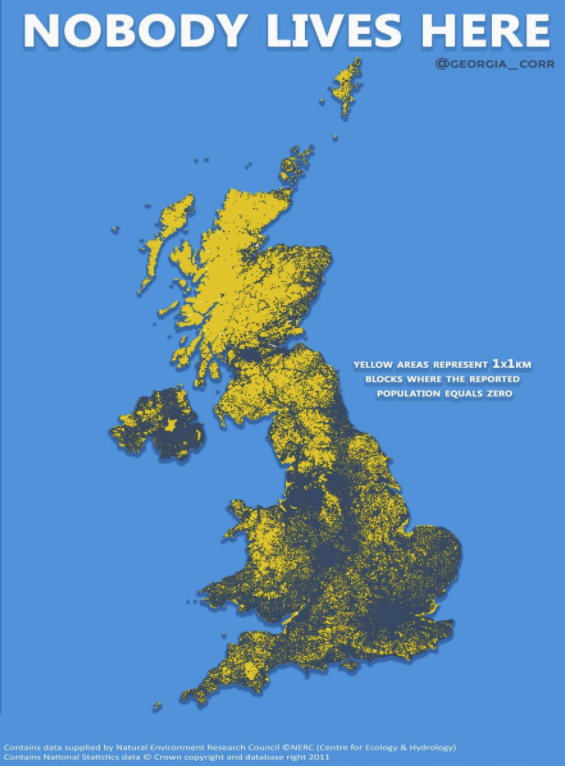 A map posted on Twitter by @georgia_coor highlights those areas of the UK where nobody lives. Local Authority Building Control is a network of approximately 3,000 professional surveyors. It represents all local government building control teams in England and Wales. Their goal is to ensure buildings are safe, healthy and efficient to meet the standards set by the building regulations. Lavoy Finicum participated in an armed occupation of the Malheur National Wildlife Refuge near Burns, OR, that took place during January and February of 2016. Mr. Finicum was shot to death on January 26, 2016, when he tried to drive past a roadblock on U.S Highway 395 and crashed into a snowbank. Upon exiting the vehicle, law enforcement officers said Finicum appeared to be reaching for a weapon and shot him. The officers found a 9-millimeter pistol in his pocket. The lawsuit identifies Mr. Finicum’s widow, Jeanette, their 12 children and the estate of LaVoy Finicum as plaintiffs and seeks at least $5 million for each from a collection of defendants: the United States of America, FBI, Bureau of Land Management (BLM), BLM employee Daniel Love, BLM law enforcement director Salvatore Lauro, former Nevada Sen. Harry Reid, FBI Special Agent in Charge of the refuge occupation Greg Bretzing, FBI agent Joseph Astarita, the state of Oregon, Oregon State Police, Oregon Gov. Kate Brown, Oregon Sen. Ron Wyden, Harney County, Harney County Sheriff David Ward, former Harney County Judge Steve Grasty, the Center for Biological Diversity and “John Does 1-100” — described as other unknown federal and state employees — according to the complaint. Jonathan Fink, a geographer affiliated with Portland State University and the University of British Columbia has posted an article entitled "Cascadia Showcases How a Coordinated Corridor Strategy Can Reinforce Urban Innovation", at the Meeting of the Minds blog. The article describes efforts to share innovation in managing urban growth, transportation and climate change amongst across three metropolitan areas of Cascadia--two n the northwest of the USA (Portland, OR and Seattle, WA) and one in the southwest corner of Canada (Vancouver, BC). It will be interesting to see if anything significant results from this effort to share innovation. Map of Cascadia showing three main metros (Citynoise, 2006). Here are renderings created by architect David Boynton to visualize the future of the Seattle skyline. The top image is from 2015 and the bottom image is everything built, under construction or proposed since then. On January 22, 2018, I came across an exhibit on display in Gould Court, the ground floor of Gould Hall, which is the building that houses the College of Built Environments at the University of Washington. The exhibit offers a reprise of recent work by landscape architects who work out of offices based in Seattle and nearby cities of the Pacific Northwest. The following are selected images from the exhibit emphasizing recent landscape design work in the Seattle area. Articles in Architects Newspaper call attention to two stuctures in Seattle. One is a recently completed mid-rise science building on the University of Washington campus. The other is a tall (58-story) mixed-use structure soon to be built in downtown Seattle on land owned by the university. The structure on campus is the 90,000 square foot Nano Engineering and Sciences Building designed by Seattle office of Zimmer Gunsul Frasca Architects (ZGF.) The innovative aspect of this building is custom-engineered products from Wausau Window and Wall Systems as described in this article. The downtown structure designed by NBBJ is a complicated mixed-use building that will rise to a height of 850 feet. It will feature a steel plate system in lieu of a traditional concrete-and-rebar core as described in this article. The structural engineer is Magnusson Klemencic Associates (MKA) and the developer is Wright Runstad & Company. The demand for newly developed real estate assets in good Seattle locations remains strong. The sale of an apartment building on Seattle’s First Hill Illustrates the strength of the market. The recently completed property called Zig is located near hospitals and Seattle University offers an example of the premium that investors are willing to pay for a new high-quality income property. The 117,000 sure foot structure houses 170 residential units and some retail space. As reported by Marc Stiles in the Puget Sound Business Journal, the price was 60% greater than the development cost. The building sold for $68.5 million—or $585 per square foot. A Loopnet listing of the commercial space contains additional property details. Urbanexus Update #4 is the fourth weekly update containing links to selected articles, images, tweets and videos about evolving physical, social and economic conditions within and around metropolitan regions that shape opportunities–and create challenges–for equitable and sustainable real estate investment and development.